Reading a good book means opening a new road to allow some more light to your soul. All of us have different shades of our own, sometimes, it becomes impossible to identify the myriad hues as they mingle with each other producing a blank canvas- the mind. Every moment, new emotions and passions are etched on it, changing the pattern and process of thinking. The more we learn, the more we unlearn. A city, like an individual, has a soul too. A soul throbbing with life and lust, flavour and fantasy, images and imagination, pathos and poesy. The city I belong to, my city, Calcutta/Kolkata. 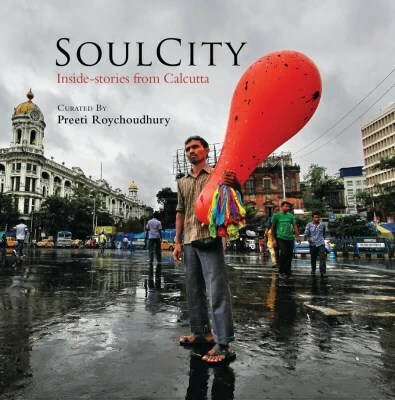 The lady, I used to think I know her, the aroma, the streets, the history, the nooks and corners, the whole nine yard so to say till I lay my hand on the book, SoulCity: Inside-stories from Calcutta, curated by Preeti Roychoudhury. Sixteen individuals have contributed, cascading their fondness for Calcutta from different perspectives through ebullient words and impressive photographs. Each story coincides at one point- that Calcutta is an inseparable part of their existence, whether they live here or not, the city lives in them, with them. The book opens with a poetical prologue by Preeti herself. Like a true word-conjurer, she has set the stage, revealing the contents in a subtle way helping the readers to anticipate what is in store for them as the pages are turned. And, lo! As you turn the pages, one by one, the lady comes alive with all her exuberance. None of the stories bears any title and, thus, they have become not only personal memoirs but a chord in the sequence of notes that has formed the symphony of Calcutta. The first one, Brian Paul Bach’s account, unveils the lady’s different moods, the fun, the architecture, the heritage, the comfort and, the coherence. To quote Brian, “The bland has no place here”. The line has been deeply accentuated by Deepanjan Ghosh’s story, a perfect concoction of history and street foods of Calcutta. A delectable mouth-watering account with some food for thought, too. Sajani Mrinalini Dutta is able to discover Calcutta in small things around the world. The love never dies because, she says,“Calcutta can be anywhere, if I decide to allow myself to find her”. I find resonance in Ahona Panda’s memoir, perhaps because I grew up in that part of the city she has written about, I had a dog who died an untimely death, my uncle lived in Midnapore, and, I love dogs. Sammya Brata Mullick weaves a gossamer of thoughts, almost in a surreal way as he chases his own shadows (or dreams?) in the serpentine lanes of North Calcutta. His writing has made gully cricket so alive! Preeti portrays the lady in changing canvases of the day, the love and loss, triumphs and setbacks soaked in some “imperfect melody sung by Time” with an impalpable harmony existing somewhere. Amava Bhattacharya has written a vibrant saga of the footpaths and hawkers. Truly, the pavements are impregnated with so many untold stories, of joy and grief, loneliness and solidarity. A very entertaining read by Nandini Banerjee would make you acquainted with another aspect of the city, the BERAL (yes, the feline flavour is there, but there’s more to it). There are two contributions in Bengali, one by Amartya Saha and another by Rajib Dutta. Both the pieces are short, crisp, precise hitting where they are intended to. 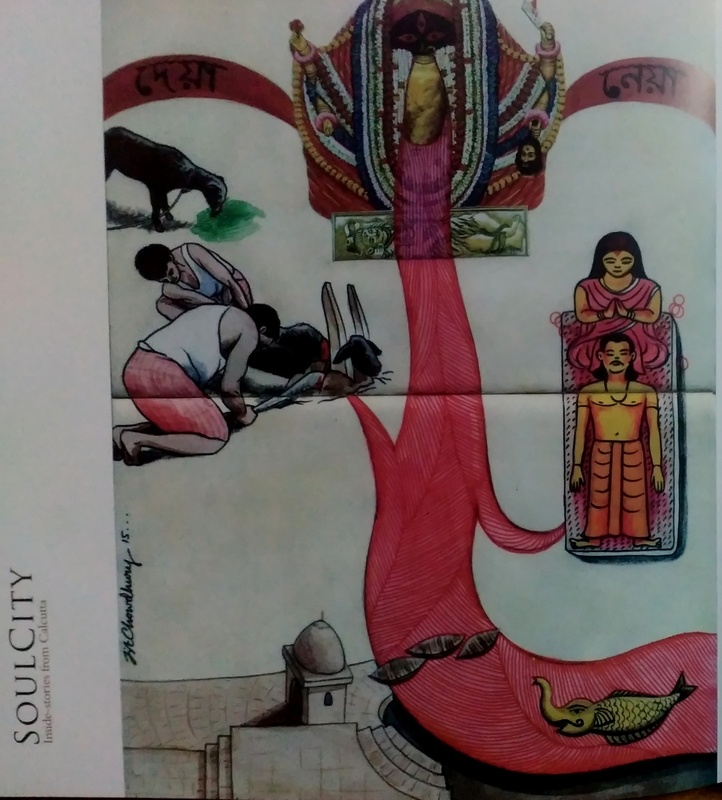 The sketch illustrations by Jit Mukherjee are meaningful with subtle nuances that bring out the character of the city or ‘bangaliaana’ to be precise. Pictorial contributions of Anamitra Ghosh, Soumyadeep Mukherjee, Farah Gherda, and Chandradeep Mallik have made the book a treat to the eyes. The Calcutta Cartograph at the end of the book by Samit Roychoudhury provides an excellent food map of the city featuring some reputed and some not-so-well-known food joints. Indeed a treasure for the food aficionados. This coffee-table book is a musical kaleidoscope, of myriad colours and vibrant tunes, of unknown hues and unheard music. A book that would make you pine for the city if you’ve visited it ever, if not, you’ll find your imagination running wild and your heart throbbing faster to have a glimpse of the city. Calcutta is not only a city of bricks and stones. She is a living lady, her irresistible pulchritude, her agony and madness, her mundane melancholy- these are the inside stories, the Soul of the City. One thing I would like to mention regarding the two contributions in Bengali, they should have a gist written in English for non-Bengali readers. It would have helped them to grasp the meaning correctly. There was another session held last Sunday to promote this book where I could go through it in brief and I must say it looked fabulous. Oh yes she does have a soul, this city. Loved the review and will be getting the book pretty soon. Not only because some of my friends have contributed in it but also because it has some really beautiful stories and should be treasured by all of us Cal lovers. Way to go. Never visited the City but heard a lot about the City’s greatness and heritage.. The Review truly brings back those memories, Maniparna.. Well Presented! I don’t know much about the city of Kolkata and after reading your review, I think I should buy this one. I can feel the magical beauty of Kolkata through your review. I will be seeking this one out, I find it interesting to try and get a feel for a person’s city as well as from their writing. I would love to learn more about your city and its unique vibrancy. It’s a great substitute before I can eventually go. I tend to avoid tourist guides as much as possible,I like to know what the sites are but mainly so I can avoid them unless they fascinate me, it’s much more fun knowing a real city than the facade put on for the tourists. What a remarkable review, Maniparna! The first paragraph is eloquent, philosophical, and deep. I’m so moved…. Nice review Mani. Well written. I so wanna read the book now. Your review made me do! Thanks for sharing dear. ‘ This city has a soul’ I truly agree with these words. Somewhere I feel I have a connection with the city & Bengali people. Though I have visited the place ever in my life. I would love to soon. The old world charm & richness of the place is so intriguing. You have reviewed the book wonderfully, capturing the very essence of it. I am sure;y going to check it out during my next visit to India. It is so challenging to write about city like Kolkata and write what has not been already written. I loved your review. Will look forward to read this book in near future. wow! Lovely, so many essences one can get from the description,very profound. A compelling review. I am sure will like the book which is about a vibrant and soulful city. nice review! I think Calcutta would be a fun place to visit! I am sure it would be amazing! I can smell Calcutta through your words. I would definitely pick this one, the pictures are beautiful!. Tell me something…so much has been written about Kolkata, people who live there love the city, but why then does it lag behind. ?.You know what I mean. Lovely review. As you said, the cover is indeed amazing pulling you in to read the book. I’ve always had an attraction towards Kolkata and, some day I’ll visit it, in spite of my laziness. 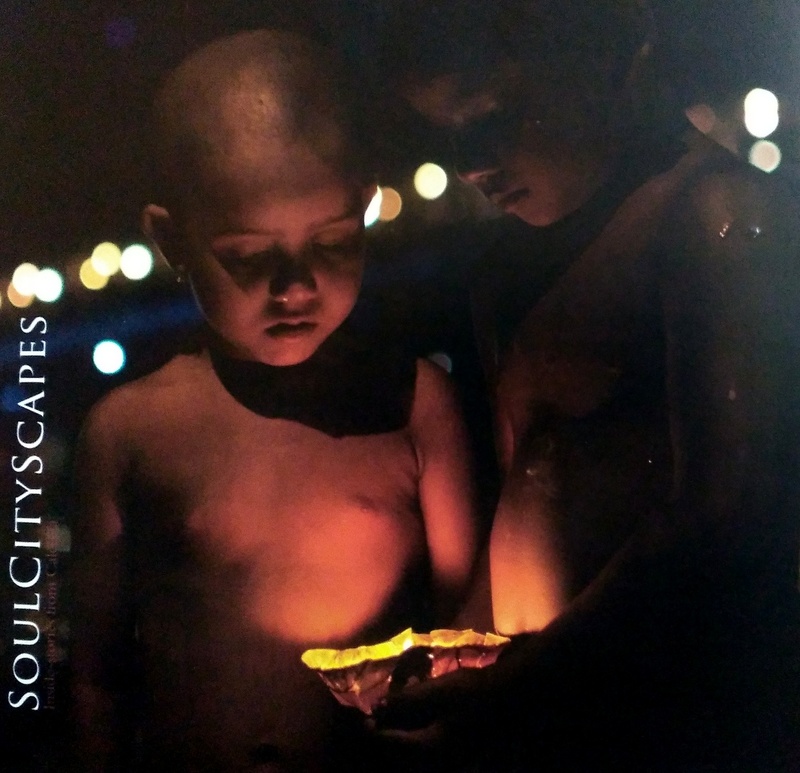 I loved the review and the opening of your post, where you mentioned that a city has a soul. I strongly believe in that. And, a city is sympathetic to only those, who have a matching nature, conforming to its soul. Some day I’ll dare to get over my laziness, which I embraced when I quit biking. Then Kolkata will be the first city I’ll visit. I always was enchanted by the magical city. Amen!